Anne: I have always been fascinated by how and women have been able to pursue their ambitions to be serious writers and artists. It requires a lot of single-minded devotion, while women have historically been told to live for others rather them themselves. My first book was about the first generation of American women writers to view themselves as serious artists, and the books I have written since then have all grown out of that early work I did in graduate school. One of the writers that I included was Constance Fenimore Woolson (1840-1894), who has always struck me as the most ambitious, dedicated, and accomplished one of the bunch. She was an amazing writer who had been almost completely forgotten. When she was remembered, it was as a close friend of Henry James and not as a famous writer in her own right, which she was. Even most scholars of American literature had never heard of her. It was important to me to share her story with a wider audience, to help her reclaim the critical and popular acclaim that she experienced in her own lifetime. Greer: Which other forgotten women writers do you believe deserve renewed attention? Alice Dunbar-Nelson (1875-1935)—She was a Creole who grew up in New Orleans and wrote some fascinating stories set there. Then she went on to become a journalist and civil rights activist. Buried in archives are tons of work that she couldn’t get published in her lifetime because they dealt with the persecution of African Americans or lesbian themes. Today some scholars are working on bringing these works to light for the first time. Sui Sin Far (1865-1914)—Her real name was Edith Maude Eaton, but she published under a Chinese pseudonym. She and her sister, the daughters of an English father and Chinese mother, are considered the first Asian-American fiction writers in the U.S. She wrote some fascinating stories set in Chinese communities along the West Coast in the first decade of the twentieth century. And she wasn’t shy about exposing the rampant prejudice against the Chinese in those days. Kay Boyle (1902-1992)—She lived in Europe in the 1920s-50s and was witness to the rise of fascism, WWII, and its aftermath—and she wrote about all of it. Her powerful stories were published in major magazines, and she was correspondent for The New Yorker after the war, covering the Nuremberg Trials. I’ve written about all three of these women in my newsletter, “The Bluestocking Bulletin.” (http://eepurl.com/dhnSBP), which features a profile of a little-known woman writer every month or so. Greer: I'm a proud subscriber myself! What’s your next book about and when will we see it? Anne: My next book I’m calling a “biography” of Little Women. The beloved novel by Louisa May Alcott is turning 150 this year, so my book is a celebration of its legacy but also an examination of what it means to us today. As my own daughter was growing up and figuring out what it meant to be a girl and a woman in our culture, I wondered if Little Women, and its portrait of the rebellious Jo March, would still matter to her in the way it had for earlier generations. (I gave her the middle name Josephine, after all.) So the final chapter looks at what girls are reading and watching today and examines how so many of the most popular heroines today (Hermione, Katniss, Rory Gilmore) are descendants of Jo. Other chapters examine whether boys should read Little Women (spoiler alert: yes! ), how the films have captured it over the years, its massive impact on the development of women’s literature, and, of course, how Alcott wrote it in the first place. 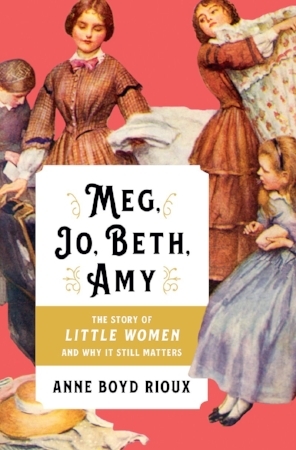 Meg, Jo, Beth, Amy: The Story of Little Women and Why It Still Matters is coming out on August 21 from Norton. Even before that, in July, I’ll be talking about it at the Alcott home in Concord, MA, and at Edith Wharton’s estate in Lenox, MA. I will also be at the American Library Association in New Orleans. Greer: First of all, I love your hashtag and plan to start using it all over the place! I love that there does seem to be a movement, particularly in historical fiction, to foreground the stories of real women from history. Even better, whereas a few years ago these books focused on the wives or daughters of famous men, now it's women who were or should have been famous in their own right. And many of us are lifelong history nerds, so not only are we having a wonderful time sharing these names and stories with readers, but we're building and strengthening our shared community by communicating with each other, confiding in each other, about these things we've found. It feels great! But, as you so rightly asked, is it a fad? How do we make it not be a fad? How do we get ready to combat the agents or editors who, three years from now, might say, "Oh, aren't there enough books about forgotten women already?" And I think part of the answer has to be that we keep delivering the best possible work to our readers. The seeds of the end of a fad are often sown by a drop-off in quality. If you're writing a story about a forgotten woman just to "ride the trend," it shows. Readers who get their hands on a book like that and are disappointed are less likely to pick up the next one that comes along. So for the authors whose passion truly drives them in this direction -- and I can't tell you how enthusiastic so many of the authors participating in these #womenshistoryreads interviews have been -- I say, keep writing these stories and push yourself to write them better than you ever thought you could. And to writers who want to lay claim to a forgotten woman's story just because they want in on the trend, I humbly suggest finding a different topic. People like you, Anne, or authors like Erin Blakemore, Karen Abbott, Mary Sharratt, you were surfacing women's stories before it was cool and you'll still be doing it if it becomes a less "hot" thing to do. We've been here, we're here, we'll be here.